Treacherous Orchestra are a powerful force in Scottish music; a huge eleven strong, folk big band that delivers epic, incendiary live performances. You can see them at The Apex on Monday 18 April. On stage the players are hugely entertaining, mixing their original tunes with theatrical anarchic rock attitude. Here is a band playing at the next level, technical, impressive and yet impossibly raw, whose shows are always vital and make the audience feel alive and in the moment. The players set a musical course that continues to build and build. Through their music the band take the listener on a journey that encompasses many moods, emotions and tempos, often within moments! A Treacherous gig is an aural, visual treat, which is why they are widely regarded as one of Scottish music's greatest live acts. Each member of the band brings a strong individual sound and instrumental style to this powerful blending of the old with the new. In addition, many of the group are also gifted composers, producers and engineers in their own right and it is these cumulative talents that set the band apart in terms of forging their own unique interpretation of Scottish music. Treacherous Orchestra play at The Apex on Monday 18 April April at 8pm. 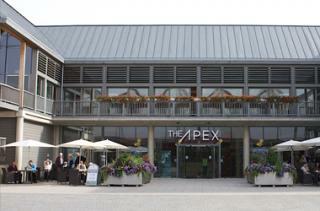 Tickets are £15, ring the box office on 01284 758000 or see the website - www.theapex.co.uk for details.